Mark those diaries and dig out your ‘World’s Best Daughter/Son’ mug, because Father’s Day is on Sunday 21st June! And with the second biggest gifting day of the year for men’s fragrance and grooming on the horizon, there’s a huge array of new launches making waves at Escentual HQ and kick-starting office chatter about new favourites. Hot off the men’s skincare press! This latest addition to the Acqua di Parma’s famous Collezione Barbiere shaving collection is a finely crafted formula that transforms your daily routine into a moment of luxury. Newly relaunched for 2015, Michael Kors for Men has been renovated with a new juice, a sleeker look, and plenty of sensuous appeal. The luxurious fragrance is inspired by Michael Kors’ mantra of “wings, wheels and water” – that’s the high-flying jet set life to you and me – presenting a new signature that that is, according to our Product Manager, Richard, “a fragrance for the ages, and fabulous to wear on any occasion”. Its aromatic notes of black pepper, star anise and incense are supported with intensely sensuous notes of suede, patchouli and sandalwood; a seductive combination that lasts for hours. If it’s something a bit fresher you’re after, then look no further than the latest launch from Guerlain. This brighter version of the original L’Homme Ideal is perfect for the summer months, as our head of Digital Marketing, Alan, has discovered: “as much as I want/try to, it appears that you can’t get away with wearing intense fragrances in the office during summer. If you find that good skin days are few and far between, it may be time to step up your routine. And our top pick for getting your skin back to its best? The Ole Henriksen walnut complexion scrub, an energising, foaming exfoliator that has been met with universal acclaim from Escentual team members, both male and female. For guys, buying skincare can be daunting. Which products are best for you? What do you use, and when? Men-only skincare brand Lab Series has taken out the guess work with their High Tech Travel Set, which offers a well-rounded skincare routine that will make skin feel fresh, clean and cared-for. 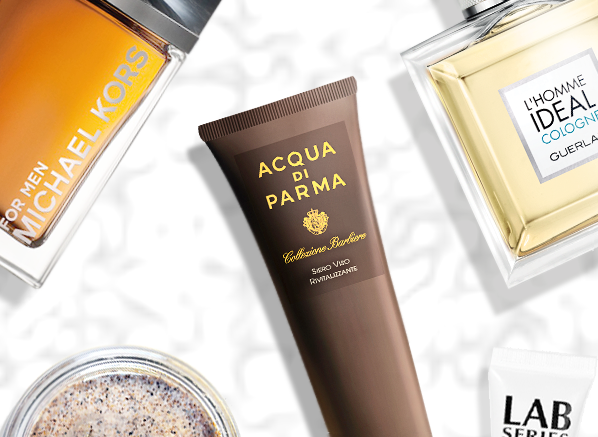 This entry was posted on Monday, June 8th, 2015 at 5:00 pm and is filed under Fragrance, Men. You can follow any responses to this entry through the RSS 2.0 feed. You can skip to the end and leave a response. Pinging is currently not allowed.